But even so, there are so many good bits in that introduction that I really don’t mind having read it at all. Brooks notes that Denon had “the passion for intelligent travel, and the eloquent recording, in word and image, of what he saw.” Denon is quoted as enjoying “the happiness of dreaming before great historical objects.”4 This struck me because that’s something I genuinely care about. I think it’s important to actually go places, which is something even really great projects like Google’s art initiatives just can’t replace. In any case, I really liked that line, but do not recommend the book. 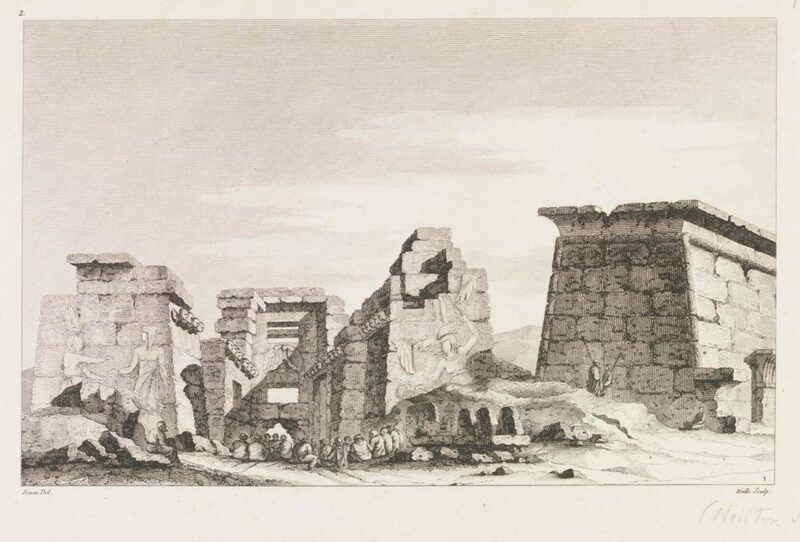 So instead, here’s a Denon etching of Egypt from his Egypt book, which is at the Victoria and Albert museum, where I will be going soon. Did you know NYRB has bilingual editions? I did not! I read it in English because my French is BEYOND TERRIBLE, so I won’t suffer through reading in French unless it is 100% necessary or out of pure love. Listening to the entirety of The Three Musketeers has left me with much uncertainty as to whether or not I had read this book before, or some kind of pared down children’s version. My guess is that it’s a Wishbone novel for me. End of another fantastic pool book, listened to entirely while semi-drowning under the watchful eyes of undergraduate lifeguards on my waterproof iPod shuffle. You can actually read this whole bit here as part of Brooks’ article “Napoleon’s Eye.” It’s on page xi in the book. Pretty much never going to leave The Neverending Story behind. Funny, because I didn’t even really think I liked that book that much.